Children's Stories - Ah, Cheese! Gillie was a plump, brown mouse. His tummy was fat because he ate too much cheese. He lived on a dairy farm with many cows and goats. It was in a beautiful glen filled with rowan, birch, and pine trees. During the day the cows stayed out in the meadow and grazed on the tall grasses, heather, bracken, and fern. At night, when Gillie needed to warm his tiny paws, he would run into the barn and cover himself with the amber straw that had been laid out in the stalls for the cows to sleep on. Each morning Gillie would scurry into the meadow to look for nuts and seeds. The glen was a peaceful place where all you could hear were the larks singing in the trees and the sea rushing in over the stone covered beach; its waves crashing against the granite cliffs. There were no sounds of cars honking or train whistles tooting, like in the city. A small stream brown-stained by peat, bubbled and trickled past the cows as they nibbled on the tender green shoots and purple flower bells. Gillie often bathed in it. Gillie always wore a wee kilt. It was dark green with thin yellow and red stripes through it. It kept him very warm. The highlands of Scotland can be bitter cold, especially when the wind blows and the damp mist floats in from the sea. On one of these misty mornings, the cows awakened Gillie as they left the barn. Their loud moos nearly shook the wooden walls down. Farmer MacHaggis took them to the shed for their morning milking. Gillie followed them and watched as Farmer MacHaggis carried several wooden buckets filled with fresh, creamy milk into the house. He was very excited. Today Mrs. MacHaggis was going to make cheese and butter. Gillie loved cheese, especially cheddar cheese that was orange, creamy, and sharp flavored. Whenever Mrs. MacHaggis made cheese, she always put the leftover pieces into the rubbish. Gillie would gather them up, carry them to the barn, and hide them. Sometimes he had to make several trips, but it was worth it. Gillie rubbed his chubby tummy. After milking, the cows were sent out into the meadow to graze. Gillie ran to the window and peered inside. He watched Mrs. MacHaggis pour the milk into the wooden churn. She started stirring the milk. It sloshed around and a few drops seeped out the sides onto the heavy oaken table. She soon scraped some creamy yellow butter out of the churn into a large glass bowl. Gillie watched as she held it up to her nose and sniffed it. His nose started twitching, as if he was sniffing. Mrs. MacHaggis stuck her finger in and scooped some butter out. It was the color of lemons, bright and yellow and glossy. She licked her finger clean. Gillie heard her sigh with delight, as she tasted it. After she’d finished with the butter, she poured another bucket of milk into a tall oak barrel. She stirred and stirred, covered it, and then went into the other room. Gillie knew it would take a few days for the cheese to form, so he ran back to the barn and nibbled on some nuts and seeds that he’d gathered the day before. A few days later he went back to see if the cheese was ready. He climbed up onto the ledge and peeked inside the window. Mrs. MacHaggis was dumping the orange cheese out onto a large wooden board. 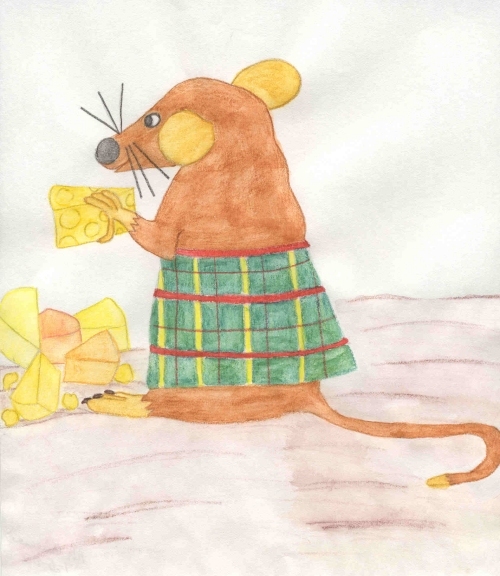 Gillie watched patiently and started licking his lips as she picked the huge pieces of cheese up, wrapped each one in cloth to dry and age, and put them in the pantry. Gillie’s mouth drooled as he saw bits and pieces of cheese fall to the ground. He started to jump up and down with excitement as he watched her sweep the cheese up and carry it out to the rubbish. He waited until she’d gone back in the house and then ran over to see the cheese. He peered into the rubbish. He could see dozens of small pieces, enough to last him until the next time she made cheese. He gathered up as much as his little arms could carry and took them to the barn. He lifted up some straw and hid them carefully under it. Gillie ran to bring more cheese but when he came back with his arms loaded, he couldn’t remember where he had hid the first pieces of cheese. He set the cheese down and lifted the straw. No cheese! He ran over to another pile of straw and lifted it. No cheese! He searched and searched but couldn’t find it. Where was his cheese? He knew there was a lot more cheese in the rubbish, so he just buried this new pile somewhere else. He ran back to get some more and when he came back with it, he couldn’t remember where he’d hid the other bits of cheese. Where was his cheese? He lifted up the piles of hay looking for both of his missing piles of cheddar, but they were no place to be found. Gillie was getting upset. He hid his third stash in a place he thought he would remember and ran back to get the rest of the cheese. It was a big pile with lots of large chunks of cheddar. He carried them to the barn and ran to the pile of hay. He lifted the corner and looked down. There was no cheese. "Where was his cheese?" He set down the cheese and frantically searched through all the piles of hay. His cheese was nowhere to be found. By now his fat little tummy was rumbling with hunger. He nibbled on a few small bits of creamy cheese. It tasted delicious. He sat down and pulled his kilt down over his legs. He was getting cold. He pulled some straw up over him, curled up in a ball, and tried to remember where he’d hid his cheese. Just then he heard a noise. It sounded like a mouse nibbling away on cheese. In a corner of the barn stood a small gray mouse. It had gathered all the cheese that Gillie had brought into the barn and it was sitting in a big pile near its feet. No wonder he couldn’t find his cheese. Gillie approached the small mouse. Alexander looked up at him. His eyes were big and brown and he was skinny. Gillie realized that Alexander was very hungry. Instead of being angry, Gillie let the hungry mouse eat all the cheese he wanted. There was enough for both of them. Alexander stayed in the barn with Gillie. Instead of being a skinny mouse, he was soon as fat as Gillie. Whenever Mrs. MacHaggis made cheese, both of them stood at the window and watched, and both of them carried the small bits from the rubbish to the barn, and both of them ate all the pieces.